As I finish projects, I'll post their pictures here with a brief description of why I chose that pattern and where I found it, if its not an original of my own. I hope you enjoy seeing my work! 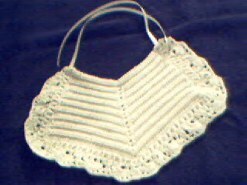 This heirloom bib was made using Lustersheen in Vanilla. The bib is for a christening where the gown is being made from the baby's great-great-grandmother's wedding dress. I had used a pattern from Fast and Fun Crochet, but have since found they do not archive their patterns. And, sadly, I didn't save this one! This lapghan was made using Red Heart Soft in Royal Blue and White. It was a request of a co-worker. The pattern can be found in Vanna White's Greatest Gift Afghans. The folded one is the same stitch, but made for one of my grandsons. 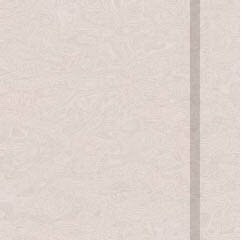 I used Red Heart for that one, also. Priscilla has some great patterns, and I've gone crazy with this one. I think all 60 of our sales reps at Xerox in Tampa now have a can cozy . This pattern can be found here. These were my first attempts at making fridgies. The purple one was supposed to look like a pansy, and the yellow is my version of a sunflower. Don't let the pictures fool you...they aren't that big! I suppose they are about the size of a half dollar. I used embroidery floss, all six strands at once. The stars were made one at a time, then tacked together and a magnet on back of each one. This purse was my very first project using more than one strand of yarn. It's also my first successful project using reverse single crochet (crab stitch)! It took about six hours to make, start to finish. The only change I made from the original pattern was to make the strap longer and make only one of them. I sold it in our craft fun-raiser at work. The pattern is free at this site. I found a site with different stitch patterns and liked this one. 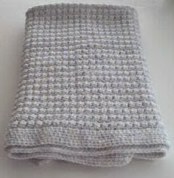 The stitch is called kitty-corner shells with double crochet. I decided to try my hand at making a scarf with it. This item also sold at our fun-raiser. Click here to see this pattern and several others. Have you done a Magic Square pot holder yet? Well, I took that pattern and whittled it down to coaster size. Mug mats, if you will! You can make three from a ball of Peaches and Cream cotton. I sold them at our fun-raiser for 75 cents each! I only paid 99 cents for the ball of cotton. Not bad, eh? Here is one of the many sites with the pattern for a Magic Square. For the coaster size, my initial chain was 20, and my finished row count was 10. Hats, hats, hats! 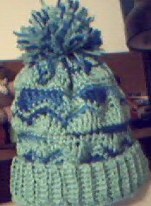 The blue hat is my very first attempt and was made last year for my eldest grandson, Dylan. I made one in red and another in yellow for his cousins, Joshua and Christopher. My sister's grandchildren, Mark and Ariel, got my next attempts. All three of these hats came from the same book, whose name escapes me at this moment. 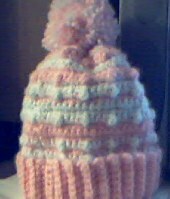 The final hat is one I made for my mother out of Homespun. 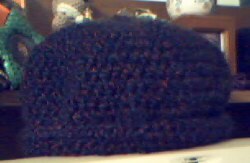 It was simply done making rounds with increases until it measured 7 1/2 inches wide, then I stopped increaseing and finished the edge with the reverse single crochet. It's so soft. This sweater is the easy baby sweater on my pattern page, but it was made by my mother! She wanted to try making it look like a little vest. Red Heart Soft Baby was used, and I think it turned out cute!